Well, I have a colour scheme that I thought of whilst I was out in Germini, I mentioned it to Tom (Purple Tom), but for now it will remain a secret! You've only spaced those Wellers out so far so everyone can see yer blingin' calipers! That could very well be true MME! Right, after getting the engine in and most of the suspension bolted on I believe I turned my attention to the hash of wiring, with a view to then get the engine started! Well, I already knew the wiring was going to be trouble, for a start it was old, since it used a 2 fuse fusebox, which meant it also didn't have wiring for a fog light (needed for the year of registration), and I believe the guy who originally built the car made the loom up himself, or severely hashed up an original. Quite a number of wires had been replaced; all with either black wire or blue/red wire, make tracing which wires went where and for what rather difficult! The dash was particular troublesome with several non mini additions, all the buttons had been taken off, and the labels had gone blank, meaning I had a mass of wires for god knows what! Anyway, I thought I might as well wire it up and see what happens, baring in mind this was one week and a day before BH2N and I had the first of my MOTs booked for the day after (Wednesday). To cut a long story short I wired up the engine and bugger all happened! So it didn't take me long to decide to go down the scrappy and retrieve the loom from a 85 City E, which helpfully would have the wiring for hazards and a fog light, although I would have to add the side repeater wiring myself. Getting the loom, and replacing it with the one in the Minus then took me through to early afternoon, so that was one MOT cancelled. The new loom meant the engine was now spinning over, albeit with the effort of a particularly lazy teenager on horse tranquilizers. I pondered, was the engine seized, had I put the Ultralite flywheel on wrong, was it an earth problem or something wrong with the starter. The long days and nights working on the car were now taking their toll and I was finding it hard to think things through properly. It took me the rest of the day and long into the night to work through several possible solutions, none of which cured the problem! A good nights sleep gave me a nice clear head, and I was able to logically go through several earth points, cleaning them up as I went. A quick jump from my Mum's Audi and it was spinning over like a good'un! So that was the engine spinning, and spark at the plugs, so why wasn't it firing up!? I quickly took off the fuel pipe to the carb to find it was bone dry. Taking the fuel pipe off the metal fuel pipe at the rear of the car resulted in a fuel soaked hand! Meaning the metal pipe was probably blocked along the way. It was kinda lucky then that I had ordered a new line from Minispares, although once it had arrived I didn't think I was going to use it. It didn't take me long to swap the lines over and the engine started! Hazzar! yay starting mini thats gotta be somthing unusual riiight? By this time (Thursday night - BH2N less than a week away) I was rapidly running out of time. I still had the cooling and heating system to plumb in, a door to put back on, seat subframes to make and seats to bolt in, harnesses to bolt in, a dash to put in, lights to wire up and the rest of the loom to wire up, arches to put on, front suspension/steering rack problem to sort out, mirrors to put on, bonnet and grille to put on, brakes to bleed and first drive and tune to perform! Thursday saw one more MOT arrive and get cancelled, and Fridays was looking very doubtful. Still, I had Friday morning off work (I had originally booked a rolling road session - cancelled), so I could work late Thursday night, and get up real early Friday morning. With the engine started the next thing was the cooling system. Due to my rapidly diminishing timeframe I had given up doing things carefully and slowly and now I was taking the quickest route to get things done. Hence when it came to the cooling system I had to use the biggest drill bit I could find to tap the Metro head's heater tap, and then use a large screwdriver to enlarge the hole! A vacumn down the hole made sure there weren't any horrible metal particles floating around that would kill my water pump! I also had to change the thermostat and housing to fit under the Minus bonnet! With the cooling system full of water, the engine running resulted in an annoying leak from the heater tap! Probably because I didn't use a gasket (didn't have a new one to use!). Something I'm yet to rectify. That night I was really brain dead, my mind had gone to sleep long before I packed up that night. I got a relatively early night to allow myself to recharge ready for an early morning. You are doing a good job. I can't wait to see new pictures. Hope you find the right colour for it. What is up next on your schedule? Now came the problems with the wipers and the hazards/indicators! I knew the old wipers had had it, so the arms and blades were changed immediately. However the original builder had used an old one speed wiper motor. This no longer fitted with the two speed wiper stalk I had on my steering column. I had changed the steering column (it came with a one stalk column) to use the two stalk column from my Clubman which matched the wiring loom I'd just put in the Minus. So, I then swapped the wiper motor and rail, again robbing the Clubman of its bits, which now meant the wipers stopped once they had finished a full cycle, and also gave me two wiper speeds! Now, the problem with the hazards was confusing me greatly. I could get the hazards to work, but only once the hazard switch was on, or the hazards would work, but only with the ignition switched to position II, and with one of the indicators on. I spent far too long on this over the weekend (Fridays MOT had arrived and been cancelled, along with the rolling road session) before deciding it was sapping too much of my time and moving on to other things on my very long to do list! The new one being a black fibreglass jobbie I'd got with the Minus. Fitting it to the hinges revealed that it didn't quite follow the curve of the Minu's arse, meaning the left side was up close to the body, and the right side left me a gap I could get the result of a woman's shopping spree through. Ah well. I didn't fancy working on the car outside on the drive that night, so I spent the Saturday night in the garage working on the drivers side door. Now when I recieved the Minus, I also recieved two fibreglass doorskins, the reason being that the old owner had intended on replacing the now badly rusted skins with them. He'd already taken off the drivers side door and removed its skin, meaning I had to find someway to attach the new FG skin on before I could put the door back on the body. Attempts to fibreglass it on succeeded and failed. The fibreglass didn't adhere to the metal frame, but due to it following the shape of the frame it kept the skin attached. However I was finding it hard to get the mix of resin and hardener correct, so I quickly ditched this plan! One quick trip to Homebase and I had a pot of impact adhesive! Which didn't work either. So after one phone call to my MOT guy to check, I bought a rivet gun and nailed the basturd on! This worked extremely well, however the fit of the skin wasn't perfect, and it bowed out at the bottom of the window, just because thats the shape of the skin! I have used this for my door skin. So now we hit the final two days! My normal MOT guy (the one I have a very good relationship with) had gone on holiday for two weeks, resulting in me having to book an MOT at an unfamiliar station, so I didn't know what the would and wouldn't pass! The list of jobs to do was still enormous; seat subframes to make and seats to bolt in, along with harnesses, fog light to wire in and bolt on, arches to put on, brakes to bleed, clutch to bleed, headlights to wire up, hazards/indicators to fix, mirrors, bonnet and grille, dash to install and door to put back on! Luckily Monday was the bank holiday, so I had all day to work on it, along with Tuesday morning, up til the MOT time of 2pm! Monday morning: I spent another hour or two trying to work out the problem with the hazards, but didn't want to waste too much time on it. So I moved on to make the seat subframes. I planned to steal another item(s) from the Vtec project in terms of seats; my lovely Fluke Motorsport carbon fibre jobbies. Placing them in the car, behind the crossmember didn't really suit my driving position, so I forged ahead and started to make some brackets to mount them over the crossmember. Quite simple they were just a rectangle of 2x2 steel bar welded together, with two holes to bolt to the seat subframe, and another two holes to bolt through the floor. Following this I removed (most of) the drivers side seat belt, and began to bolt in the mounting plates and eyelets for the harness. During this I managed to get the rachet to slip off the nut I was tightening, thwack me in the mouth, pushing my top tooth into my lower gum, giving me a lovely fat lip! Next: Fit radiator. Not a problem, I've changed the rad quite a few times on previous minis. Here's where the Minus perculiarities strike again! The loss of height in the Minus body occurs in lower half of the body, meaning 6" taken out of the height of the engine bay. Meaning with the rad in the normal position the top would be sticking a good few inches out of the bonnet! Meaning a phone call to Aliburglar stating I was stuck! From what he recalled he thinks I had to take the radiator bracket off the engine mount and turn it round. Woot! It worked, I knocked the captive nut off and welded it on the other side and the rad was now several inches lower! But the fan wasn't. Which then caused problems with hitting the rad cowling. Plus the lower rad caused havoc with trying to get the radiator hoses on, it wasn't easy, probably the hardest and most testing job I've done on the Minus so far! Anyway, I put the cowling on, turned the engine over and let the fan 're-profile' itself against the cowling. Problem solved for now. Clutch bled, no problems. Brakes bled, problems, had a leak from the mechanical brake switch. Swapped it out for a normal tee-peice and went back to an electrical tee-piece. However, during the course of tightening up the front brake line I managed to split the line at the union! Luckily I had kept the old steel line from the Clubman, yet another part 'borrowed'. Wasn't going to be easy to change over though with the modified lower radiator! Managed to do it though, despite the old, hard, steel making it difficult to bend into position. Then came the leak from the passenger side rear pipe/cylinder! 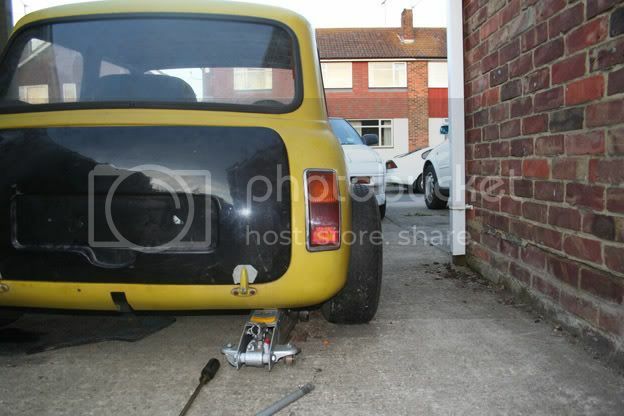 That was it for Monday, after the rear pipe started leaking (I didn't have a spare) I needed a rest! This meant I now had to get a brake line made up (the closest place I knew of to do it is 40 minutes away). Plus finish the long list of jobs, plus the 2nd hand fog light I had bought was effectively rusted junk, so now had to find a new one of those too! 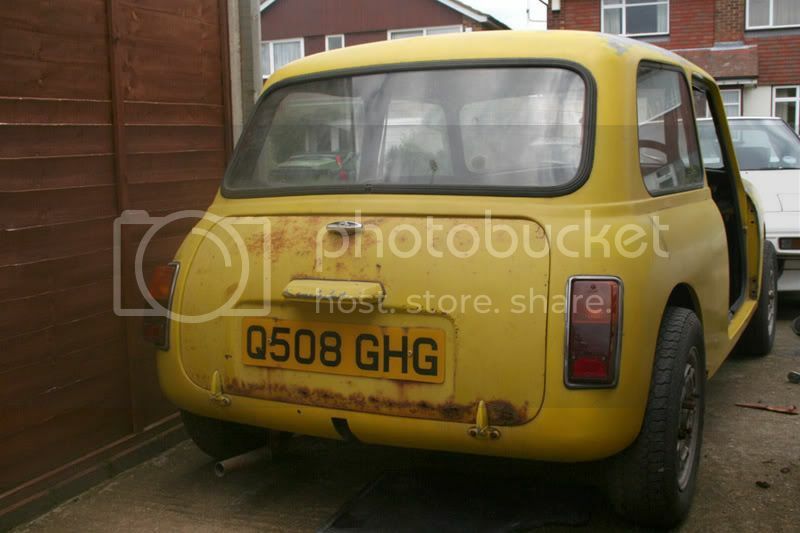 Going out to buy parts Tuesday morning would seriously eat into my time before the MOT at 2pm! I'm typing I'm typing!! Yea, was kinda last minute, should have really stuck to the plan of getting a mini with tax and MOT instead of getting a second project! But who could turn down the chance to own a Minus, especially at the price I paid for it! !